My wife loves to read murder mysteries. She's read just about every book by Agatha Christie, so when, about 20 years ago, Bachmann released a boxed set of the Orient Express I felt compelled to buy it for her for Valentine's Day. I know that sounds self-serving, and it was, but she did like it anyway. Both engines are Jouef (made in France) and they run reasonably well. They are tender driven, but they've both lost the o-rings on the drive wheels. (I've heard that bullfrog snot works well for this). I have room for one more car, and I plan to go to a European train show in California next November and will look for something there - any suggestions? Anyway - I'm thinking of someday building another layout for this train to show it off. I won't run anything else - at least I'm not planning to that at this time. I'm looking for ideas - for scenes that would be appropriate for this train. I would like a station - but not something as grand as Paris or Istanbul (no room). A nice country station would be good. Most of the photos I've seen of this train are either in a big station or running through the countryside. So I'm thinking of a lot of scenery - maybe a long bridge and tunnel with a small village and station at one end. Any resources with good photos and any ideas for an appropriate station would be wonderful. Considering that the Orient Express ran from Istambul to Paris via Bulgaria, the former Yougoslavia, Italy, Switzerland and France you have a very wide choice of landscapes and different architectural styles, without considering signalling and similar details. So the first thing would be to choose one country (France seeems to be the obvious one due to the presence of french locos). The baggage van wasn't used as brake van as all the material was equipped with continuous brake. I wouldn't add any more coach as, contrarily to what one could think, Orient Express (being a luxury train) wasn't very long and beside this, coaches were very heawy in itself so as most of the road was on mountainous land compositions couldn't exceed hauling capability. Given the Agatha Christie connection with the train, I'd be inclined to model a layout in the snow with scenery for terrain in Serbia, where if I recall correctly, the express is when the murder takes place. Franco - thanks for the info. I guess I was thinking too American - our special trains are a lot longer. Good to know. Question: Did the train change locomotives at each border? Al - yeah after I posted this I got to thinking that the events in the movie should be my starting point. I'm going to try to get a copy of the DVD. I only have a vague memory of the movie and I've never read the book (maybe I'll sneak a peek at my wife's copy). I did a Google search and saw a lot of the snow scenes - it might look nice, but I'm concerned about keeping it clean. And I love that station - that's just about what I was thinking of. And I like the idea of the local police waiting there for the train. This is going to be a fun project. 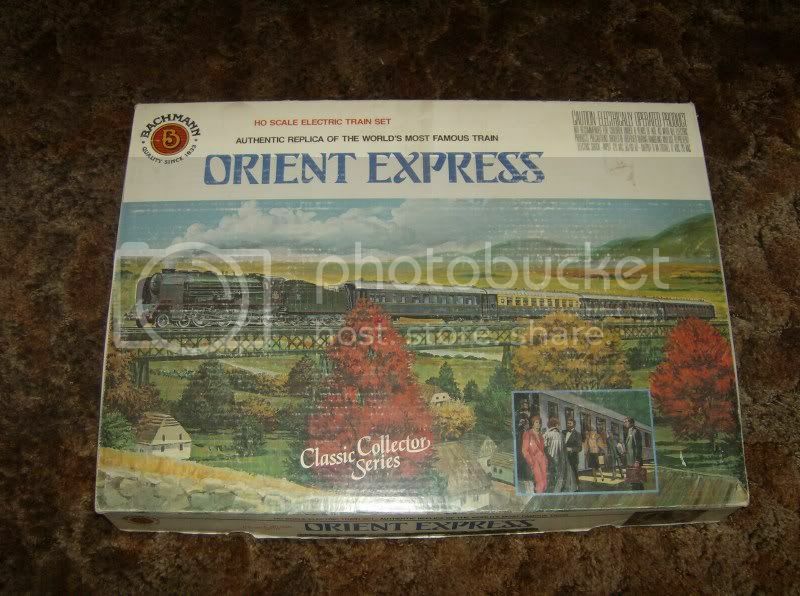 I've been modelling the 1974 film version of Agatha Christie's Murder on the Orient Express in N Scale. The train in the film is very short consisting of a locomotive and just four coaches. I found the information at this website which also has a diagram of where Hercule Poirot and Mr.Ratchett were at the time of the murder, (might be of interest to your wife). http://www.eisenbahn-im-film.de/info/motoe.htm (In German, but Bablefish does a fair translation). He has a scan of the 1939 Simplon Orient Express timetable with a full list of stations which may be of use for modelling ideas. Albert Finney, who played Hercule Poirot in the film, is almost unrecognizable. See him in The Bourne Ultimatum playing Dr. Albert Hirsch to see what he really looks like. I understand that a new TV version of Murder on the Orient Express starring David Suchet was shown on US TV in July. We in the UK will have to wait until December to see it. Thank you Poliss for the great information - it will be very useful. And I am now committed to only running the four cars. As I said before, it never occurred to me that this train was so short. Yes! in the meantime of custom checks! beside this, movies on the subject aren't really a good reference as they weren't turned in locations, and CIWL's rolling stock of the 30's was quite different from post war. This takes that if you look at these movies with a "railfan" eye you'll find as many goofs as you want. As our friend said, in the movie you can see a french locomotive of the 141R class clearing the track in serbian territory but more than this, that type of locomotive will be built some fifteen years after the time the action is suppposed to take place. Well, if you want to be really picky, Istanbul station in the film is actually shot in Landy Depot outside of Paris because Istanbul station is now far too modern looking for the period the story is set in. By a strange coincidence I notice from the Google home page that it's Agatha Christie's 120th anniversary today. There was a television special to go with the recent movie where they show Suchet travelling on the train and being touristy through it. I suspect the composition varied muchly -- one sleeper seems insufficient for a whole dining car. If you want another car, I would go with another sleeper. I have a drawing that shows a van at the front -- closer to a boxcar than a baggage car. Check the movies The Lady Vanishes and Night Train. There have been incidents of people departing from the train at speed, frequently in dark tunnels or over bridges. I just checked 2 books that discuss the Orient Express. From my childhood, Great Trains of the World (Wyatt Blassingame) and Great Trains of all Time (Freeman Hubbard). I'm not sure if you can call the cars "Pullmans"; they were owned by Wagon-Lits (CIWL). Everything changed at the borders. In the dining car, the one food cupboard was locked and the next one opened. It seems that King Boris III of Bulgaria was a train fan and would get into the cab and drive. France and Italy found out and he was restricted to driving in Bulgaria. David - as I understand it, Pullman built the cars specifically for the Orient Express. 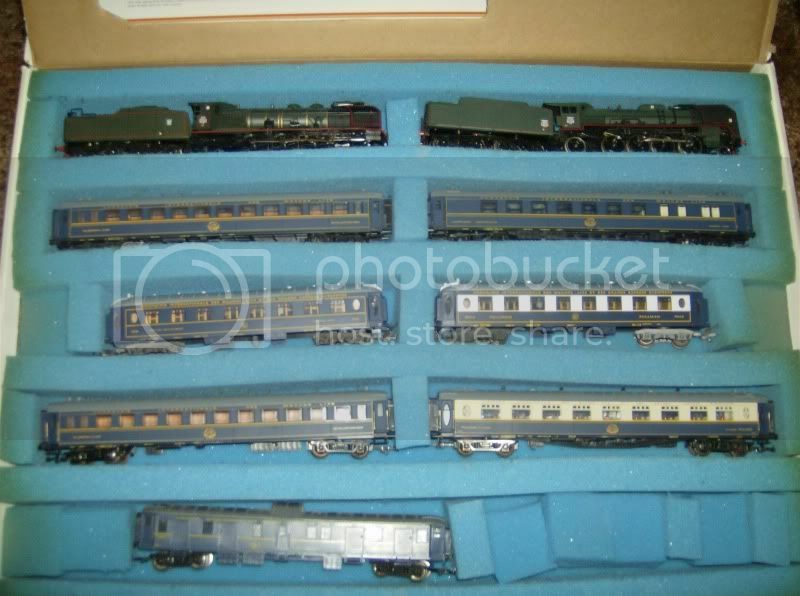 And the original train set came with two sleepers, a dining car, and a 2nd class Pullman that is set out with tables and lamps on each table - I suspect it's a saloon car. But no baggage car.